ran is host to some of Asia’s most diverse animal wildlife. Its lush Caspian coastline, arid central deserts, majestic mountains and fertile plains are the habitat for a vast range of creatures. Eskandar Firouz’s prize-winning book is the most comprehensive work to-date on the fauna of Iran. 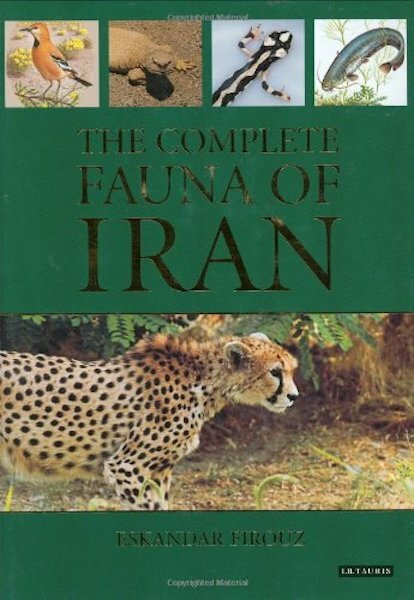 Indeed it is the only book to cover all of Iran’s vertebrate fauna, comprising mammals, birds, reptiles, amphibians and fish. With details of a total of more than 1,000 species, it also summarises the history of zoological work previously undertaken in Iran – from Hamdallah Mostofi 660 years to investigations of the twentieth century. The author also examines the rise of the conservation movement in Iran in the 1960s and 70s. These decades witnessed an increasing awareness of conservation issues and saw the establishment of national parks. Firouz looks at how far the Iranian government’s stated policy objective of preserving biodiversity and arresting environmental degradation has been successful, since, in spite of these avowed goals, the last quarter century has seen further habitat destruction. The position of a number of species unique to Iran, such as the Asiatic cheetah, is critical. More than an invaluable source of scientific knowledge and a brief history of Iranian zoological study, this book warns of an environmental situation which is becoming increasingly imperilled and is an essential reference for all concerned with or interested in the vertebrate fauna of Asia and the Middle East. Eskander Firouz, the distinguished Iranian conservationist and naturalist, is a former Director of the Department of the Environment in Iran. He has been Vice President of the International Union for the Conservation of Nature and Natural Resources, and held the same position at the Stockholm Conference on the Environment in 1972.